Water services throughout Greece are municipal, except in the two biggest cities of Athens and Thessaloniki. In these two cities, the municipal companies which were founded (Law 1068/1980) as 100% state-owned companies, were turned into public-limited in 1999 (Law 2794/1999),, and were floated on the stock market in 2001. One major impact of austerity policies on people and society has been in the area of health care services. Health care workers have seen their salaries slashed by up to 50%. The number of beds in public hospitals has been reduced, while at the same time, the number private hospital beds have increased. For over five months, journalists, technicians, musicians, news editors and support staff of Greece’s public broadcasting network, ERT, have been occupying their newsroom. In June of 2013 all 2,500 public workers were laid off by the Greek government due to austerity measures. Occupying workers continue to provide 24-hour news coverage to Greek citizens for no pay. Greece, well known as the birthplace of democracy, has been reeling from the impact of punishing austerity measures for five years. Deep cuts to the public sector have left wages low and unemployment high for all working people. Austerity has created an uncertain, unstable future for Greek society. In 2010, Greece’s government faced an uncertain future. Unable to finance the country’s debt, the nation’s leaders turned to the EU, the International Monetary Fund (IMF) and the European Central Bank – together known as “the troika”– to cover its financial needs to the tune of €45 billion for the remainder of the year. As a condition of this loan, Greece would not only sacrifice its economic independence but the future of its people as well. The unnecessary chaos being wrought on the people of Greece by its government and international lenders was summed up by a government minister, a leading trade unionist said today. Responding to a question from SYRIZA MP, Nadia Valavani, during a conference in Lithuania, last week, European Economic and Monetary Affairs Commissioner, Olli Rehn, confirmed that Greece’s fiscal monitoring would not end when its bailout expires, regardless of whether that is next summer, or if a third package is needed. Ομάδα ειδικών, στελεχωμένη από δημοσιογράφους και ομιλητές συνεργαζόμενων συνδικάτων από όλο τον κόσμο, αναμένεται να συγκεντρωθεί για την πρωτοβουλία Δίκτυο δράσης εκπροσώπων των PSI-EPSU στην Αθήνα από τις 4 έως τις 8 Νοεμβρίου. 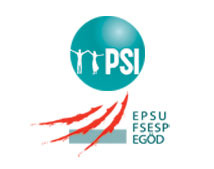 An expert team of affiliate union journalists and communicators from around the world are gathering for the PSI-EPSU Communicators’ Action Network initiative in Athens, Greece from 4-8 November.